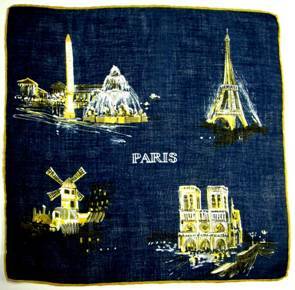 Perhaps no other city in the world evokes such passion as Paris. When it comes to romance, we envision lovers strolling along the Seine, but truth be told, for many it’s the city itself with which they fall in love – body and soul. 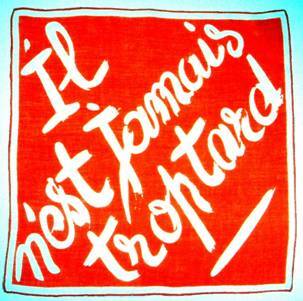 Many who protest they’re not “romantic” admit an ardor for the City of Light. A passion for a city exciting and enticing. A city of mystery and allure, grandeur and nobility, novelty and originality. She is simultaneously classic and chic, dashing and demure. 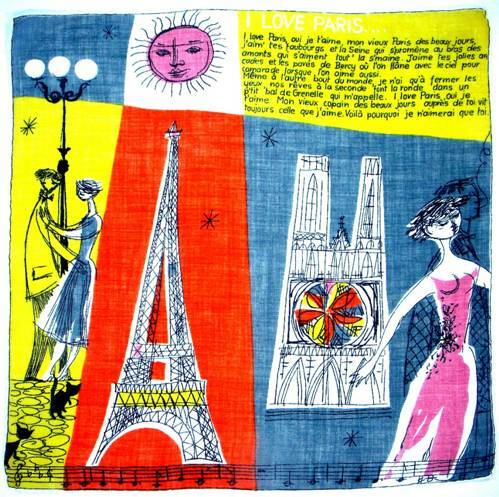 She is Paris. Whether sheathed in starlight and sparkling fountains where lovers kiss at midnight, or encircled in a whirlwind of joy like lovers in springtime, Paris will capture every corner of your heart. This pink, persimmon and sunburst beauty contains couples floating Chagall-like through boulevards of breathtaking vistas. It’s so chimerical and dreamlike, you want it to go on forever. Your love for the city overflows to the one you’re with, until you’re not sure where your feelings begin and end. 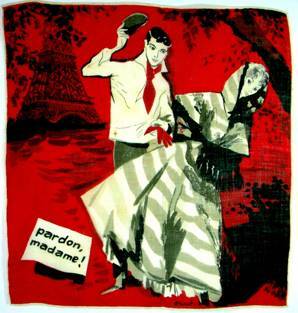 Ah, but wise courtiers have known this secret for centuries, and employ the allure of Paris in the game of love. 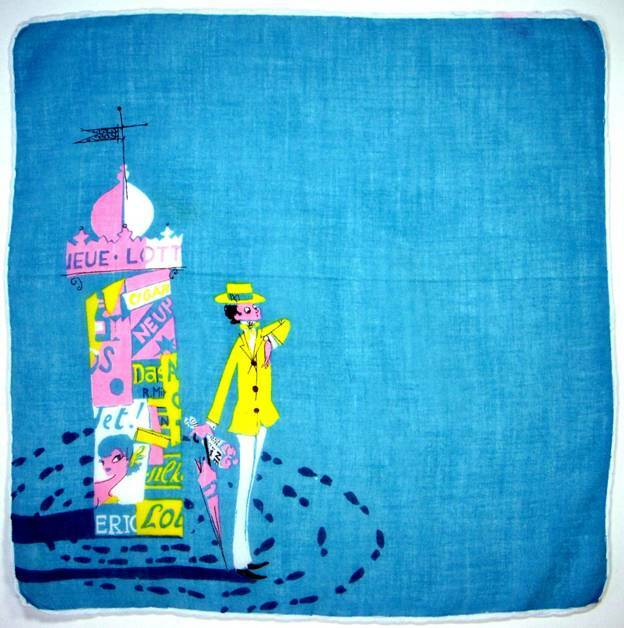 “Paris” never evokes a single image. Like the word ‘banquet’, a flood of memories assaults the senses. 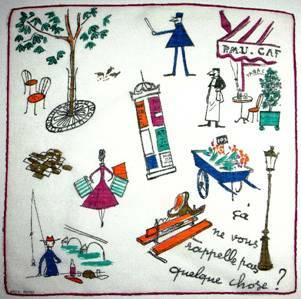 Here artist Jacques Charmoz captures that enveloping impression – with postered kiosks, fanciful flower carts, a fuchsia fashionista in the triangle d’or, snuggling lovers, fishing for déjeuner in the Seine, an attentive maître’d, a commanding gendarme, even stately street lamps and worn cobblestones. 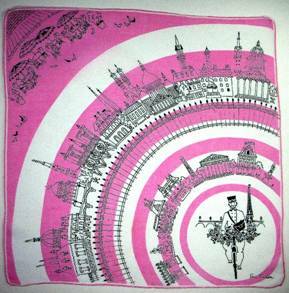 His wonderful graphic alongside pays tribute to the other form of Parisian Romance – passion à deux. Her words say no, but her body says yes – as lovers intertwine in a frenzy of fervor. 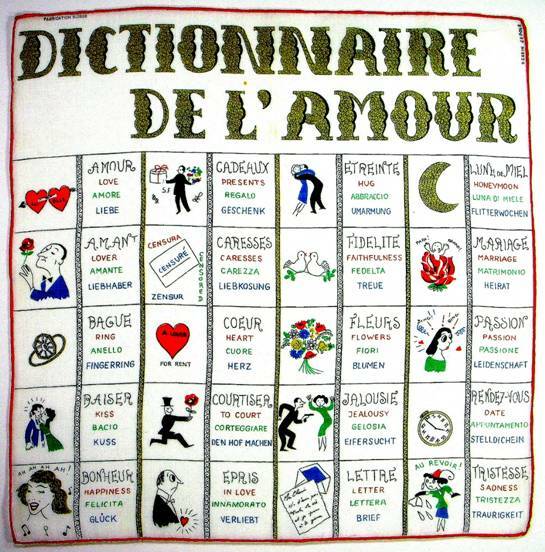 What other city provides a dictionary for l’amour? 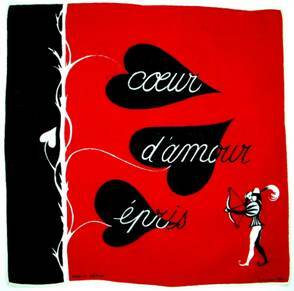 Everything from cadeaux (gifts) to baiser (kiss) is here to assist mademoiselle in navigating the sea of love teeming with trysts, flings, and flirtations. Romantic embellishments adorn the city, echoed in fanciful curves of wrought iron grilles entwined with tender vines. 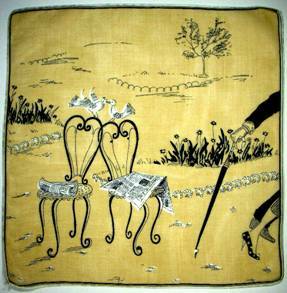 The hankie on the left recalls the omnipresent Juliet balconies, while to the right, love birds perch on fanciful garden chairs to tweet adieu to a departing duo. We’re shown only the hint of a polka dot pump and beautiful umbrella, but hope their flirtation ripens into courtship. What’s the subtext behind the discarded papers? Do they meet regularly, whispering sweet nothings behind the newsprint? Was their rendez vous the result of answering a personal ad? The plot thickens….. The park is filled with couples sharing love songs and soft kisses. Even flowers frolick in joyful abandon. 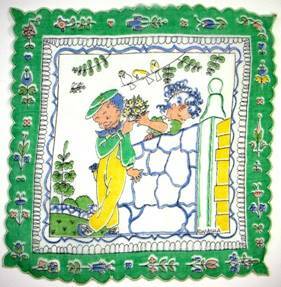 The hankie on the right explains “The primrose is the symbol of first love and the tulip is offered to declare this love.” Note the silhouetted profiles of an adolescent boy and girl nestled at the base of each blossom. 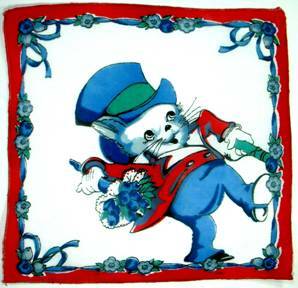 Even children’s handkerchiefs carry images of romance, including the implication to carry a bouquet when you come courting, whether you’re a sassy ‘fat cat’ in top hat and tails or suitor as shy as his sweetheartboth too bashful to lock eyes, much less lips. 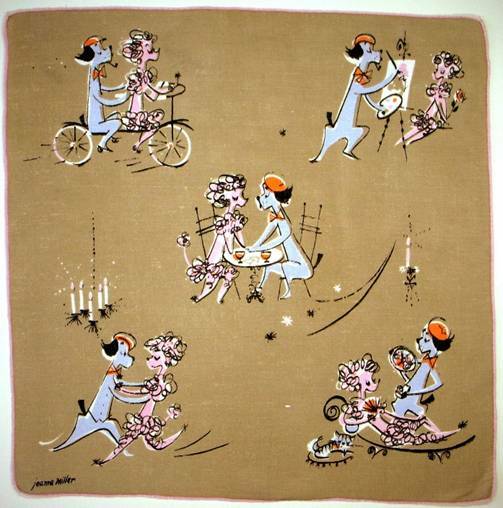 Romance is tenderly conveyed by the artist Peynet. A suitor offers his heart, sheltered by a tiny umbrella, as cupids cheer approvingly. When honeymooners on the right arrive at customs, the mustachioed inspector discovers their bags contain nothing but love. My, my. Note the lovebirds nesting in the background and wee bluebirds in the foreground. 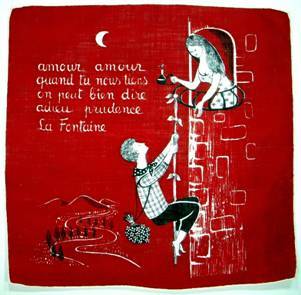 Ah, but to achieve l’amour, one must wait in hopeful anticipation for overtures to be reciprocated. We cross our fingers for this stalwart squire who has literally walked himself in circles at his chosen lieu de rendez vous. “I kissed my first girl and smoked my first cigarette on the same day. 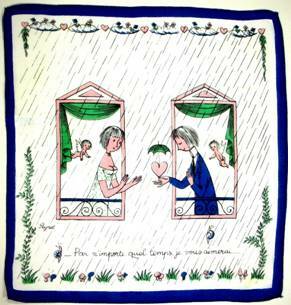 Our heart aches for this tearful jeune fille whose intended has departed with another. We’ve all been there. 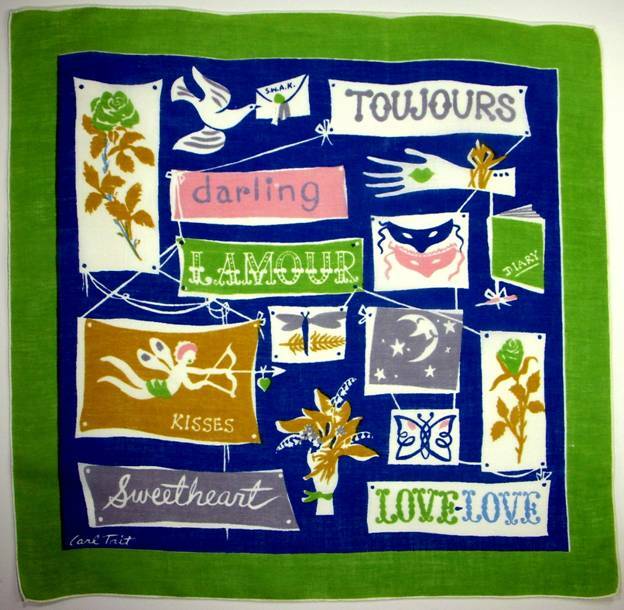 The hankie at right reiterates the theme of unrequited love. 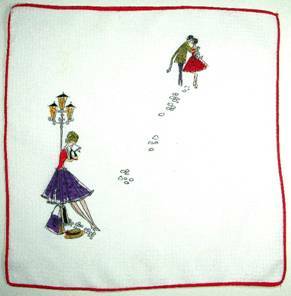 “I have passed by her unnoticed…not daring to ask for anything…” This soulful story has been repeated in hundreds of love songs and poems. 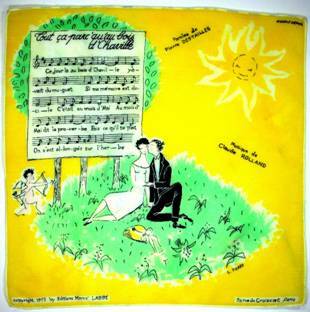 Although we may wish to wallow in misery, with Roy Orbison’s “Crying” playing in the background, these colorful, bold hankies admonish “No Crying!! 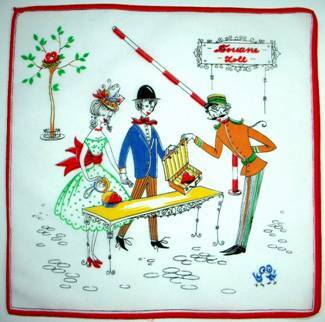 !” and “It’s Never Too Late.” The green hankie is almost threadbare, leading us to believe that despite its message, it has dried many a tear. 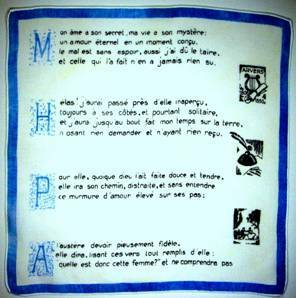 So many situations would benefit from these wise words, it’s surprising I haven’t found more hankies like them, the French equivalent of Keep Calm and Carry On. Aren’t they great? 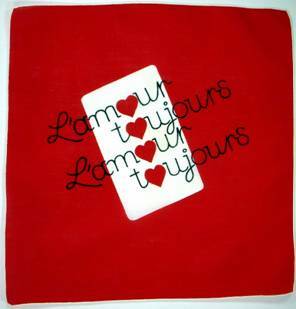 Here’s a hankie of pure joy to tuck into your pocket – Toujours l’Amour (Always Love), Darling, Sweetheart, love letters, roses, butterflies (symbolizing new beginnings) lily of the valley (symbolizing a return to happiness). It’s romantic, fun and celebratory. Just how one feels when in love. 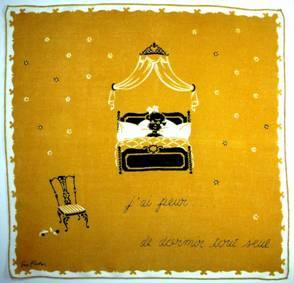 Naturellement, l’amour requires a bit of kissing, which then requires a lipstick handkerchief to erase the evidence. 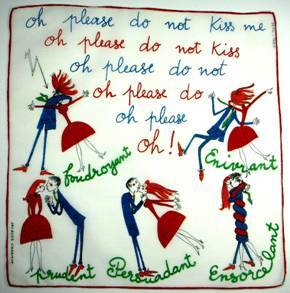 When a lady dabs her beloved’s cheek with L’amour toujour, she flashes a flirty promise of future assignations. The lady on the right tries valiantly to resist the seductive swain doffing his beret, but in vain, I fear. After all, this is Paris. 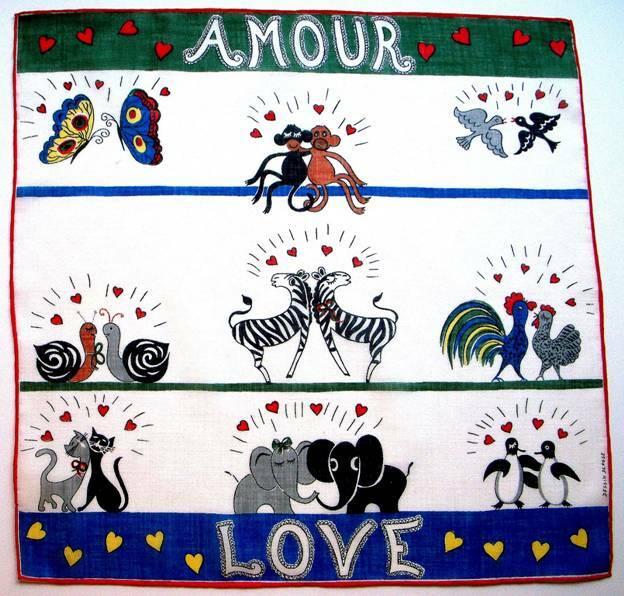 Animals are more forthright in responding to desire, and are often used as proxy for man in romantic images. 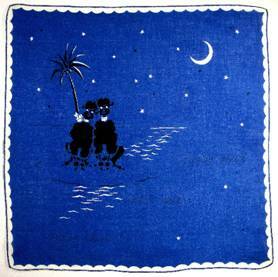 These canoodling poodles are joyfully content to be stranded on a desert island in the moonlight. 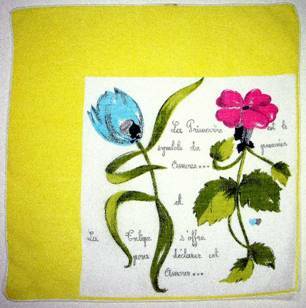 The hankie reads “Nous deux rien que nous deux” – the two of us, just the two of us. 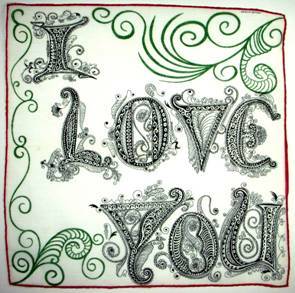 The words are worn and barely visible, indicating a well loved hankie. 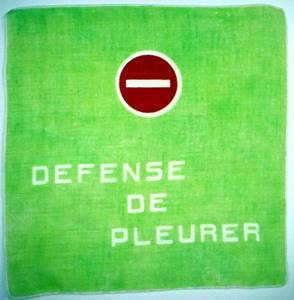 To the right, la mademoiselle in her frilly boudoir exclaims “I’m afraid to sleep alone.” What brave protector wouldn’t want to calm her fears? Lay this little golden message on the table alongside your digestif or flute of champagne, and your mission is a fait accompli, in the most feminine and flirty way imaginable. Bonne nuit! 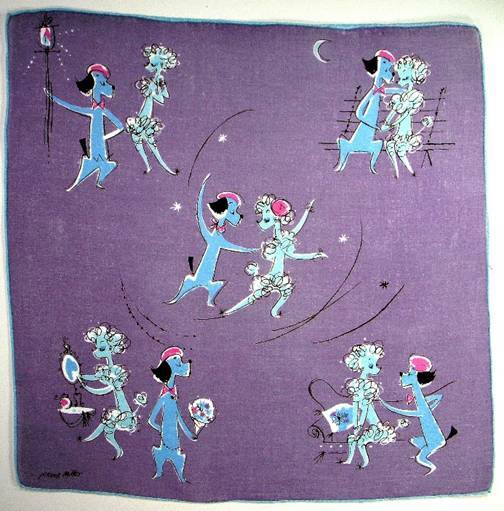 This pair of hankies exemplify par excellence the exuberant, ebullient experience of falling in love – with the most fetching coquette and dashing Romeo, both head over heels in the dance of romance. 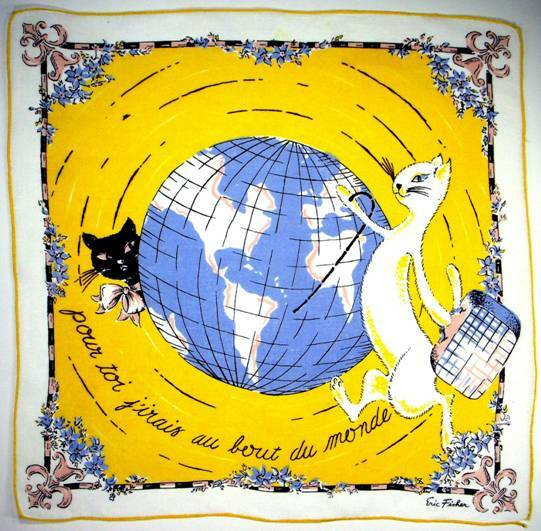 Not to be outdone by canines, this swanky cat proclaims “For you, I would go to the end of the world.” Note the fanciful take on the fleur de lis transformed into floral urns anchoring the corners. Perfection. Amour needs no words, as lovers are clearly revealed via the chemistry which sparks and crackles between them. So whether you’re in love with the city of Paris, or with the promise of falling in love in the City of Love, our wish for you is that all your romantic dreams come true.